In recent issues of the Otaki Mail we have written about putting children at the heart of all our decisions. Now the Otaki community has the opportunity to make that happen. Working under the government’s Children’s Action Plan, Otaki/Horowhenua has recently established a pilot ‘Children’s Team’. This is a new way of working together in partnership with children, families/whanau and support services – all aimed at getting vulnerable children the help they need quickly and efficiently. 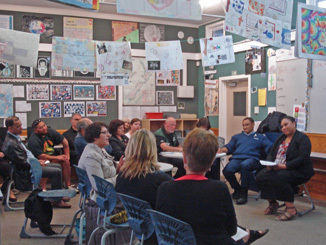 At a recent meeting held at Otaki College, all the heavyweights were there: the college and other schools, Ministry of Education, Police, Midcentral Health, Iwi, KCDC, Child Youth & Family, Social Welfare, Te Puni Kokiri and members of the community. All were prepared to protect vulnerable children, working with kids we worry about, keeping them safe from harm, with wrap around quality services and a leading professional from Otaki in charge of an agreed plan. If this sounds like a tall order – think again. The fifty people at the meeting were determined to make this work. It is driven by the community and has a greater chance of success because of that. The teams will work closely together, making decisions together and agree the plan together – all for the benefit of the child. Parents and guardians will also be involved, for without their agreement the process simply would not work. They must agree to be involved and to share information. The team will bring the right people together whether it is from health, education, social welfare to support the child. There is a national board overseeing the whole NZ-wide Children’s Plan with members from the ministries of education, health, justice, TPK, police, pacific affairs, social development and the national children’s director. Under them there is a local governance group with representatives from schools, police, social welfare, health, iwi and councils ensuring that the resources are available for the Child Action Teams there to do the actual work. Whether it is too top heavy to be efficient remains to be seen, but if the willingness and calibre of the people involved locally is anything to go by, it is a good fit for Otaki. “This is a very different way of working for our kids; putting kids first and leaving personal agendas at the door.” says local chairman Richard Orzecki. A referral comes to the Children’s Team, a lead professional is appointed, an assessment done, a personal plan developed with all the necessary providers involved – all of whom will be vetted. Andy Fraser asked why could we not bring the model to Otaki rather than be driven by Levin? “The process is not area driven’ said Program Manager Jacqui Moynihan, “and there is no reason why everything for Otaki kids cannot be driven and achieved locally”. Later in this issue the Otaki Doctors call a public meeting about working towards a violence-free Otaki, talking about family violence intervention programmes. This is a community on a roll towards putting our kids first in all our decisions. “Good on ya!” we say and we echo the words of Nelson Mandela, History will judge us by the difference we make in the everyday lives of children. They are our greatest treasure so let’s, as a community, look after them.